Page Street Publishing, 9781624143588, 224pp. With this one-of-a-kind guide to plant-based eating, it only takes 28 days to gain a healthier you. 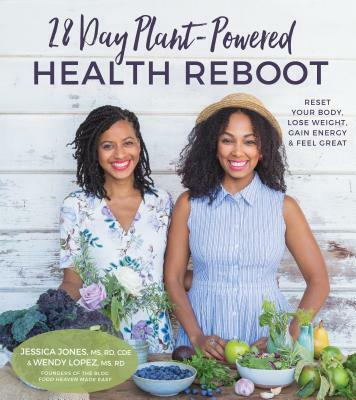 Written by Jessica Jones and Wendy Lopez, both registered dietitians/ nutritionists, each and every recipe in this cookbook is both delicious and nutritious. All of the 100 recipes have a healthy balance of carbohydrates, fat and protein and are typically between 300 and 500 calories per meal. This book is perfect for those who want to become more comfortable with preparing vegetarian meals that are not only good for you but taste great too. The beauty of this book is that you can decide how you want to plan your meals for the week, using the recipes and meal plan templates provided. These incredible recipes will leave you feeling nourished and energized, with minimal stress. You won’t need an endless amount of ingredients that will break the bank: the motto here is simple, delicious, nutritious and fun! With this cookbook, you will feel healthier while enjoying satisfying plant-powered recipes like Southwest Scramble with Baked Sweet Potato Fries for breakfast and Mushroom Black Bean Enchiladas for lunch. End your day with Butternut Squash Black Bean Burgers for dinner and if you like to munch between meals, there are tasty snacks like Garlic-Roasted Chickpeas, Spicy Dark Chocolate–Covered Almonds or Zucchini Pizza Bites. Let’s make this your healthiest year yet! Jessica Jones and Wendy Lopez are Registered Dietitians/Nutritionists who specialize in plant-based nutrition. As co-creators of the website Food Heaven Made Easy, their content has been featured in Refinery29, Self, The Huffington Post, Men’s Health, Essence and many others. Jessica lives in Oakland, California, and Wendy lives in New York, New York.